Wallabies star Kurtley Beale has been fined A$5,000 by the Australian Rugby Union for urinating outside a nightclub following last month's victory over Ireland. The versatile 21-year-old, capped four times by his country, also admitted that he had consumed excessive alcohol before the incident that occurred in the wake of his side's 22-15 victory at the Suncorp Stadium. "I have to take personal ownership for how I behave in public and I want to apologise to all those people I have let down on this occasion," he said in a statement released by the ARU. "I just want to put this behind me now and hopefully concentrate on helping the Wallabies in the upcoming Tri-Nations." ARU high performance unit manager David Nucifora revealed that Beale had been counselled but remained in the selection frame for the Wallabies Tri-Nations squad that will be announced on Thursday. 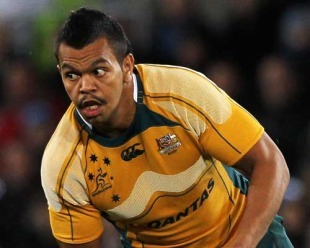 "We sat down with Kurtley today and explained to him that we cannot excuse players from such behaviour," Nucifora said. "There are structured programs in place for all our players to take advantage of where required so those opportunities are there for Kurtley, and others as well." Beale is no stranger to controversy having been charged with assaulting a female cousin at a family birthday party in Sydney at the end of last year - although he was cleared by a court last month. His Wallabies team-mate Quade Cooper was also in court this week on burglary charges stemming from an incident last year. The hearing was adjourned until September. last month the Wallabies fly-half was fined and disqualified from driving after pleading guilty to a charge of driving while on a suspended license.